The Rotary Club of the Fryeburg Area recognizes students from Molly Ockett Middle School. 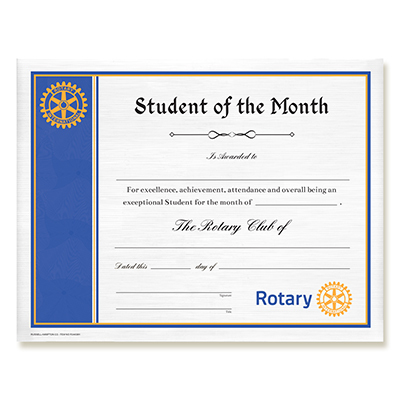 One student each month is honored based on academics, service, citizenship, and leadership . This student fully embodies the "Service Above Self" Rotarian motto and is nominated by the schools teachers and or administration. Each student receives a certificate,a $25.00 gift certificate to Bridgton Books and have their photo placed in the middle school's front awards showcase. To promote the New Generations Service object of Rotary by rewarding and recognizing youth who exemplify the Rotary principles and philosophy. We strongly encourage the school to send someone to attend the award ceremony. Teacher or administrator meet to nominte a student from the desinated grade or program for the month. The school's principle then forwards the nominaed students bio and information to the club and reaches out to the students parents to announce the achievement and facilitate communication with the club. The eighth grade team would like to congratulate Sharlah-Mae Day on being selected as the Rotary student for the month of December! Sharlah-Mae is a dedicated and conscientious student who always gives her best effort. She comes to class prepared, works well with other students, and strives to do her best work. She has a quiet way of leading and is inclusive toward other students and willing to work with and support anyone she is paired with. In addition to being an excellent student, Sharlah-Mae is involved with many school activities. She is an instrumental and choral musician, an athlete, and a member of both student council and Early Act, where she serves on the board. Sharlah-Mae works hard to balance the many aspects of her life, and she is successful! The Rotary Club of the Fryeburg Area and the sixth grade team would like to congratulate Ashley Watson on being selected as the Rotary citizen of the month for November 2016! Ashley is a dedicated and conscientious student who always gives her best effort. She comes to class consistently prepared, works well with other students, and strives to do her best work. In addition to being an excellent student, she enjoys the outdoors. Ashley likes to hunt, fish and work on building projects. She is a patriotic student and puts up the flag every day. Ashley’s positive attitude and intrinsic motivation makes her an exemplary student. Keep up the awesome work, Ashley! Ashley was presented her award by Rotarian Prudy Westerberg and she was accompanied by her mom and teacher Mrs Blynn. For October Rotary Citizen of the Month, the 7th grade team has selected someone who quietly goes about doing everything right. Hardworking and conscientious, she always puts forth her very best effort. Rarely does a minute go by that she isn’t taking care of her responsibilities. She participates in sports, playing on the field hockey team this fall, and she serves her community as a Girl Scout and as a member of the Early Act Club. Helpful to others, committed to her education, and steady in her vision for our school and our community, the seventh grade team is proud to honor Jade Blood as Rotary Citizen of the Month for October 2016.